Oliver Edwards @ The Fly Tying Exhibition Stoke on Trent . I am a very enthusiastic fly tyer and designer. To catch a trout on a fly that you have lovingly tied yourself is a special experience and one that you will want to repeat. Instruction in fly tying can be part of your fishing day or is frequently added at the end of a session in the evening. If you are staying with us it can be in your cottage or in one of the local public houses. Stanislav Mankov of Bulgaria at the International Fly Tying Exhibition. Here he is tying a size 32 !!!!!! parachute dry fly. He is studying entomology at Cambridge University UK. The Devon County Show was a great success again this year and the sun shone on all three days. 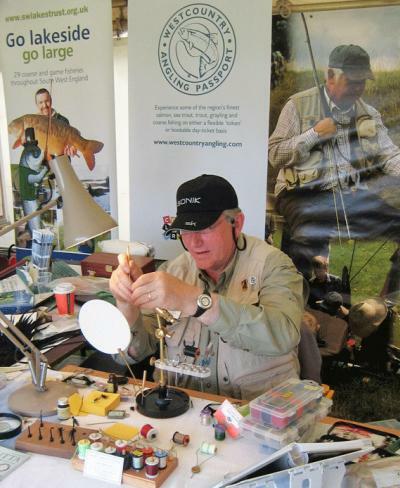 We were kept very busy casting and demonstrating fly tying throughout the show . Making many new friends, adults and children, eager to give fly fishing a try. All the knots you will ever need. Just click on "The Orvis Animated Knot Series"